Kindle Oasis is Amazon’s most expensive ebook reader. It ships with a charging cover and has excellent battery life. It’s thinner and lighter than Kindle Paperwhite and Voyage. Paper books have a charm that their digital equivalents have never quite managed to match. As book collectors will no doubt tell you, an ebook reader cannot replicate the fresh smell of a new book, or recreate the feel of high quality paper. The same collectors will also tell you that they go to extraordinary lengths to keep their books in good condition and that reading on the go, especially in crowded places, just isn’t an option. 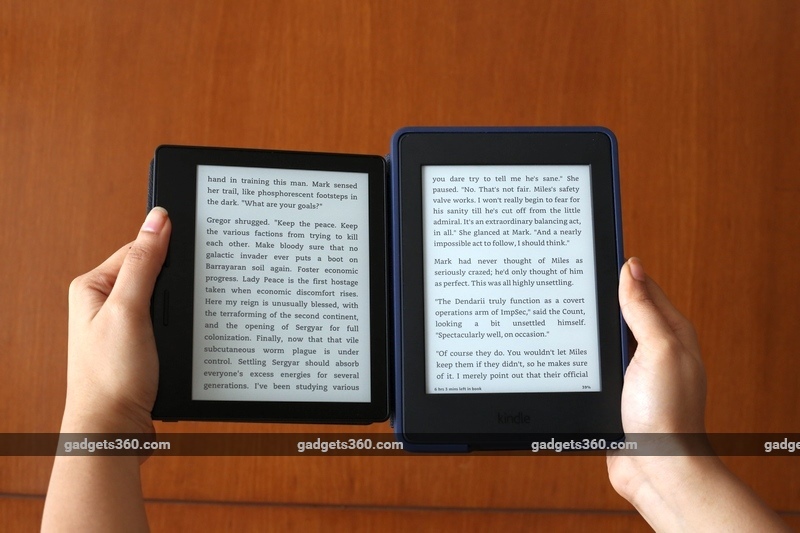 Amazon sells a number of different Kindle models, and the Kindle Paperwhite (Review) has long been its primary offering for those who don’t like how it feels to read text on the basic model. So when Amazon sent us the new Kindle Oasis, we were intrigued. Isn’t the Rs. 10,999 Paperwhite good enough for everyone? Does anyone really need to spend a whopping Rs. 23,999 on an ebook reader with practically the same set of features? We used the Oasis for a month to answer these questions. The Kindle Oasis comes in a compact box, with a USB cable and a charging cover which has its own battery, much like a power bank. You can just slot the reader into its cover and it will top itself up, so you can go for months before you’ll need to plug anything in. The Oasis has the same 6-inch screen as the Paperwhite and the Kindle Voyage (Review), but its overall dimensions make it a lot smaller and lighter than either of those models. Our hands usually ache after around half an hour of holding a Kindle Paperwhite (with its smart case), and we had no such complaints with the Oasis. Even with its case on, it’s designed to be held with one hand, and it fit perfectly in ours. Its bezel is thin on three sides and just wide enough on the fourth to house two neat page-turn buttons. When we held the Oasis, we found our thumb resting on the buttons, which made it ridiculously easy to turn pages. This is a big improvement over touching the sides of the screen to turn pages (which is also supported on the Kindle Oasis) because using page-turn buttons is just so convenient. The Kindle Oasis feels great to hold. The leather cover lends it a nice, premium feel. The device wakes up when you open the case and locks itself when you close it. This cover is even better than Amazon’s leather covers for previous models because it’s thinner, lighter, and provides much-appreciated additional battery capacity. The Oasis’ screen might seem the same as that of previous models, but you will notice the difference if you’re upgrading. First of all, the screen is on the same level as the bezel. The Paperwhite’s screen is slightly recessed, which allows small particles to get stuck in the corners. The Paperwhite also has some minor light bleeding issues, which are not a problem on the Oasis. The Oasis’ frontlight is evenly spread across the screen. The selection of fonts is limited but we were happy with the choices Amazon offers, with Caecilia being our favourite. The Kindle Oasis is also extremely convenient for left-handed people. As soon as you turn it around so that the page-turn buttons are on the left, the screen automatically flips around. The transition was always instant and we just continued reading no matter which hand we held the Oasis with. No matter whether you’re right-handed or left-handed, it’s nice to be able to switch hands without really thinking about it. Battery life was never one of the Kindle line’s shortcomings, but having additional battery capacity is always welcome. You can charge the Kindle Oasis and its cover through the port on the device itself, as long as the cover is attached. The device will notify you when the cover’s battery level is low, even when the Kindle itself has over 90 percent of its charge remaining. Even if you forget to recharge the cover, you won’t have to worry about running out of power anytime soon: we read for an hour every day and only had to charge the Kindle Oasis once in the month that we used it. Battery life is stupendous; far better than that of the Paperwhite. We reviewed the WiFi + 3G variant of the Oasis and the only time it ran out of power was when we were in an area with poor cellular network coverage – switching it to airplane mode would have prevented this. Amazon has introduced a hibernation mode on the Kindle Oasis to conserve power. It goes into this mode when you don’t use it for a while, and it will then take a few extra seconds to come on, with the message: “WAKING UP” showing up at the bottom of the screen. We found this annoying but we’re willing to tolerate it for the sake of improved battery life. The Oasis allows you to buy books from the Kindle store, or copy them off your hard drive. The process is just as smooth as it was with previous Kindle devices. The software is virtually the same. In the first week of using the Oasis, it once got stuck on a screen showing an empty battery sign. It fixed itself after we hard reset it thrice (hold the power button for 10 seconds until it reboots). It was a bit slow and laggy on a few occasions before we reset it, but after that we faced no issues. The more we used the Kindle Oasis, the more we loved it. We were highly impressed with its build quality, its screen, its case, and its battery life. However, the reality of its price then hit us – Rs. 23,999 for Wi-Fi and Rs. 27,999 for the WiFi + 3G.There is just no way we could justify spending that much on an ebook reader. You can’t use it to watch movies or play games, like you could with a similarly priced Android tablet or iPad, and you can’t really enjoy comics thanks to the monochrome screen. You can get nearly all of its capabilities for less than half that price if you buy the current-generation Kindle Paperwhite or even still save money with the Kindle Voyage, which costs Rs. 16,499. You could use that money to buy dozens of ebooks or even printed books. Other ebook readers will get the job done just fine. 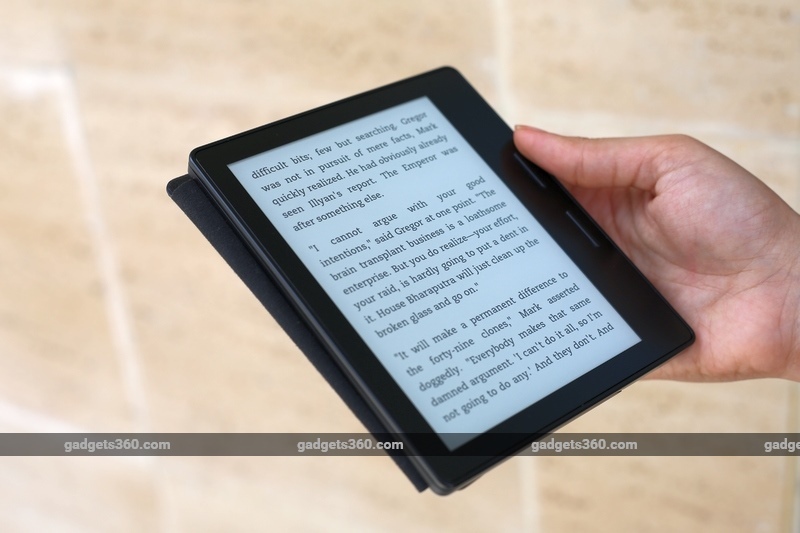 However, there are some who want absolutely the best reading experience money can buy, and if cost is not a problem, that’s exactly what the Kindle Oasis delivers.